I chose her and I thought that she was great! Sherrie Moody, Executive Director- Charlotte Players, Inc.
Scott Mason is a tremendous talent, an enormously funny man in his very own right, as sharp as a tack, possessed of a quick and supple wit, and a delightful smile and charisma that makes him the laser focus of any stage he treads. He is absolutely hiliariously funny in this, his signature role – which is simply not to be missed. 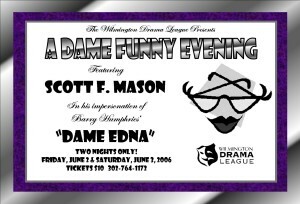 There are indeed some Great Dames out there – but imho, Scott Mason really is unmatched as Dame Edna. Book him at your earliest opportunity. You and your audience will laugh until you have to wipe away tears. The shows were a sell out and great for all ages. Scott's timing is impeccable. Extremely talented, Extremely Funny, he is a pro and very accommodating. We can't wait work with Scott again. The Christmas Show is just as hilarious as his non Holiday shows. Do not miss him when he's performing near you. I was very impressed with the detail in Scott's repertoire for my birthday party function. He took the time to learn about the venue and really made the evening something special. The Dame's dress, makeup, and comedy were all first class! Thanks again, Scott for making our night. Scott’s impression of the Dame is not only spot on, but the content of the show was brilliant. His ability to relate to current events and riff with the audience was spectacular and makes each show different from the last, which is great for multiple-show bookings! 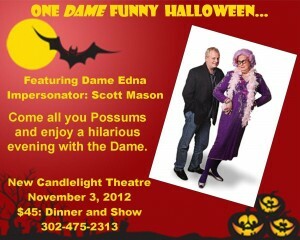 Scott Mason aka “The Dame” is one of the funniest people I have worked with! His performance at a blood bank benefit I created was truly the highlight of the show. Patrons always ask where he is performing next!. Scott is also a joy to perform with! Total professional but also knows how to make it fun and not “work”. Wonderful Show Saturday night. You made me proud. So happy you enjoyed being there and I'm sure we will get another date soon. I'm looking into more venues for you. You are such a pleasure to work with. You were superb! You just get better and better as the Dame. The costumes were a hoot and I sent a note to Dee Dee. I especially like your facial expressions and "takes". You are using pauses well. It was so neat to have the audience in the palm of your hand so that they talked back to you. Your ad lib's were super. I don't know when I've laughed so hard for so long. Thanks for a great day at the theatre. 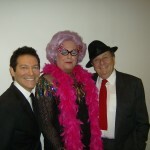 I have Dame Edna for years and years! Simply the BEST!